Steins Gate 10 – speculah drive engage! Mad scientist, Hououin Kyouma, can't leave well enough alone. In the last episode of Steins;Gate, Okarin seemed to finally realize just how big of an impact his messing with the past was having. In this episode, his mad scientist alter ego, Hououin Kyouma, refuses to let the major disruptions he has witnessed in the world-line dissuade him from further tampering with past events. This show excels at hinting without confirming, thus all sorts of mysteries have opened up, without receiving definitive answers. This has led to wild speculation in the aniblogisphere. Speculah: In the future, Daru will be the father of Suzuha (AKA Part-time Warrior). I refuse to believe it. Terrifyingly enough, I’m starting to think her dad might be Daru. Same hair, he also is part of the time travel forum, he’s a Titor fan, and he didn’t get to go to the meeting because Okarin stopped him. It’s just a crazy theory, but he’s the only one we know to be part of the forum that didn’t show up despite the fact they were supposed to be there. Yep, you know you need to stop speculating when you propose Daru actually found a 3D woman. As I responded there in a comment, Suzuha only says her dad was supposed to be AT the forum, he might have been the author that Daru mentions was scheduled to speak. All we really know is that her dad didn’t show. Since Okarin’s “Reading Steiner” ability causes him to have a blackout of events that he witnessed in the world-line into which he merges, we don’t know what actually happened at the forum; perhaps the author never showed up. One other thing we did learn in this episode, though is that the object she has been seen with several times is some sort of badge that once belonged to her dad. Another very clever hint that may be a red herring — what happened to the satellite? First, I’ll assume, along with most, that the satellite is a time machine. Speculation continues: This is the time machine that Suzuha used to travel back. It was gone when Okarin went out looking for her, thus she used it to “leave town”. While I think this is possible, let me throw out an alternative theory: Suzuha’s father, Barrel Titor was not at the forum, because he had left in the time machine. In this episode, we saw the satellite and then didn’t. 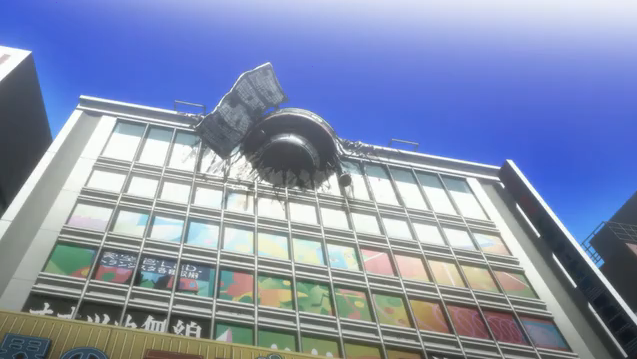 What would really help, is if we could get another glimpse of the building to see if the satellite is back after the latest world-line jump; that would be consistent with it being Suzuha’s time machine. But this still leaves an interesting bit for speculation. We see that the satellite is missing just as Hououin Kyouma decides to send himself a D-mail to prevent Suzuha from leaving. The strong implication is that he ran to see if the satellite was missing when he received the goodbye message. Does this mean that Okarin knows that Suzuha is a time traveler? Does he understand that that was her time machine? There is just not enough information here to know what to think. Finally we have the mysterious Jpeg of a delicious looking dessert. Speculah: this is a threat coming from SERN, who have detected his manipulation of the world-line. Speculah: this is Shining Finger’s ultimate stalker moe. Speculah: this is a threat from a future Christina who has gone yandere. Really there is little evidence to use to put together a sensible theory. 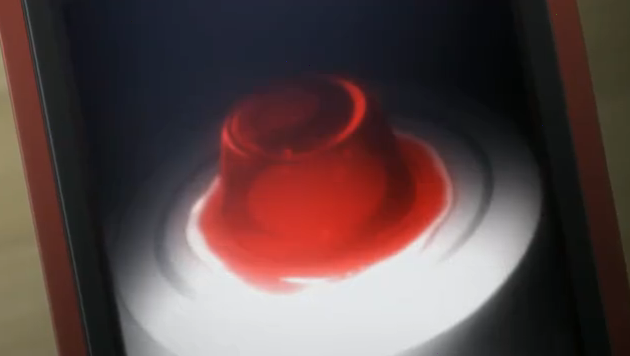 Unless this jello shows up somewhere, there is no way of knowing what this is even supposed to mean. In the end, an interesting episode from a series that knows how to tease its audience. Information is supplied and withheld in good proportion so that the mystery deepens even as we seemingly make some progress in solving it. Jello of doom. Come to capture all urz basez. Screw up Butterfly Effect. But in all seriousness, it’s kind of frustrating when a show throws something like this at you. It just begs for discussion by over-analytical fans like me, lol, though I have no idea what it’s supposed to be. Also, the whole Daru theory about being Suzuha’s dad makes sense though I have a feeling that it won’t be true… maybe it’s just coincidence that Daru wasn’t at the forum when Suzuha was…. We don’t know for a fact that Daru wasn’t at the forum, since the past was changed. Okarin picked Suzuha up at the forum and brought her back to the lab for the party, it isn’t impossible that Daru could have gone to the forum and the party as well. To be clear, I don’t think Daru went to the forum (at least Okarin didn’t tell himself to let Daru go). My point is just that the Daru=daddy theory is hanging on some weak premises. Another weak premise: Daru’s hair color. I don’t think this matters in the slightest. 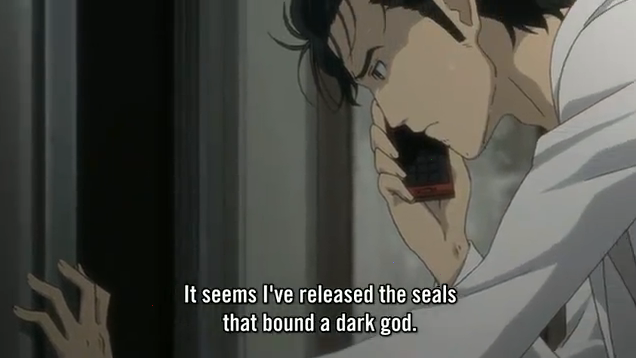 Okarin has the same color hair as Mayushi and Ruka, that doesn’t make him their brother. Also, Moeka has the same color hair, that doesn’t make her Daru’s daughter. The jello is just so weird. Don’t know what to make of it at all. How I see it, either Suzuha met Daru at the meeting, or she met Daru back at the lab. Either ways, she would have met her father and not disappeared. 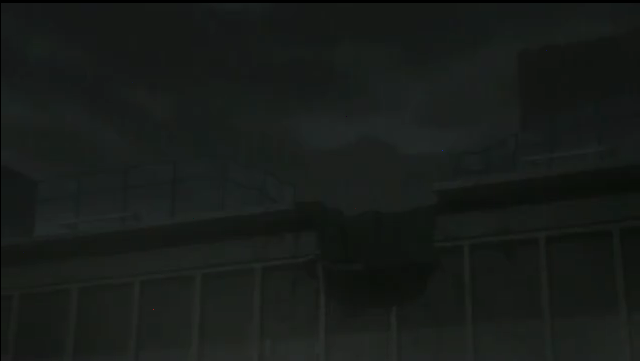 The disappearing satellite is very suspicious coincidence too, and I feel is definitely a hint at Suzuha’s actual role in this seires. Except I don’t see why she wouldn’t have met Daru before, given that she works downstairs from the lab. But you’re right, it is the nature of speculation to be unstable; if we had facts to feel more confident, we wouldn’t even be calling it speculation anymore. Either way, I appreciate that this series gets people’s minds racing. I enjoy reading about even the crazy ideas. Even so it shows that it isnt too reliable since he gave Rukako the numbers and failed to win the lottery regardless. The show explains everything rather well which I appreciate and I like that it only explains what is necessary rather than bore viewers with a thorough thesis on World Lines..As the episodes go on theyre starting to become checklists to cross off for confirmations and speculations. True. You really hit one of the strengths of this series: it feeds out enough info to keep the viewer engaged, without wasting a lot of time on “explanations” of fake science. Yep. 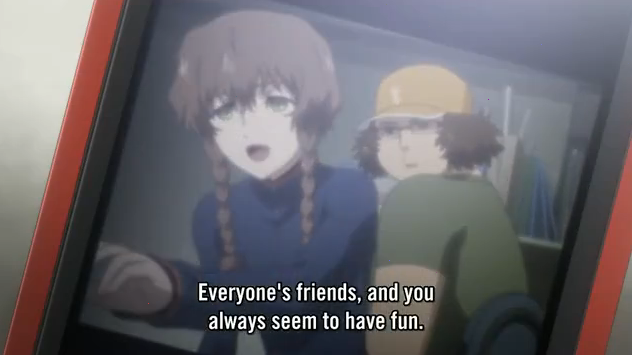 Daru is Suzuha’s father. Listen! You have to change the world’s line by tommorow! I have come from the future, you have to believe me! I cannot tell you why you have to do it, you’ll understand later. Just change it! I DO change the world-line ~ everyday. For example, today I used up a package of frozen cherry blintzes that were in the freezer. Mwuahahaha!